AirSketcher, a novel electric fan that enables the user to directly control the directions and paths in which wind is blown, is presented. 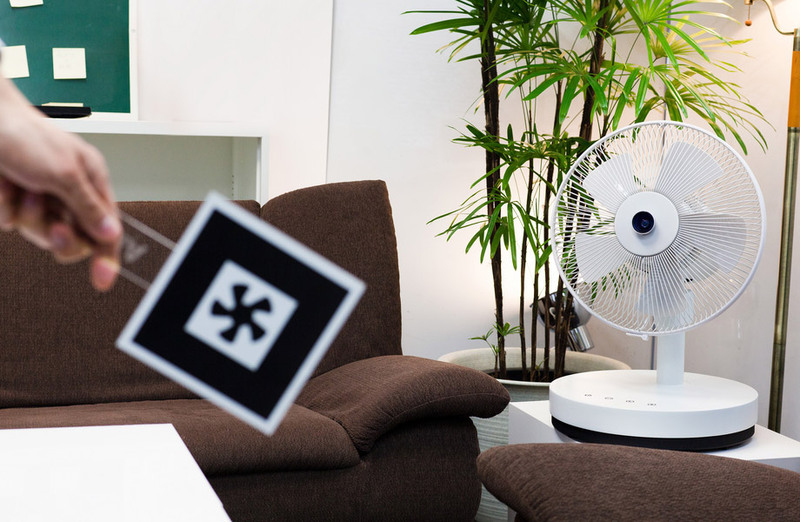 AirSketcher is a robotic fan with two servomotors to control its orientation and an embedded camera. We introduce three techniques that allow the user to control and design wind direction and path: 1) AirWand: Drawing the wind path by moving visual markers through the air in front of the fan, 2) AirCanvas: Drawing the wind path on a tablet display that shows the camera view, and 3) AirFlag: Putting control markers in the environment to specify the manner in which wind is to be blown to the areas where the markers are placed. The AirSketcher fan we propose enables the user to have wind blown accurately anywhere within a closed space. It allows the user to intuitively and directly specify where the wind is to be blown and the strength at which it is to be blown. This technique allows users to control and design the blowing of wind by using the following three techniques. AirWand: Drawing the wind path in the air. AirCanvas: Drawing the wind on the display. AirFlag: Placing flag cards in the environment. Good Design EXPO 2011, August 2011.